I have been containing this announcement for weeks now. 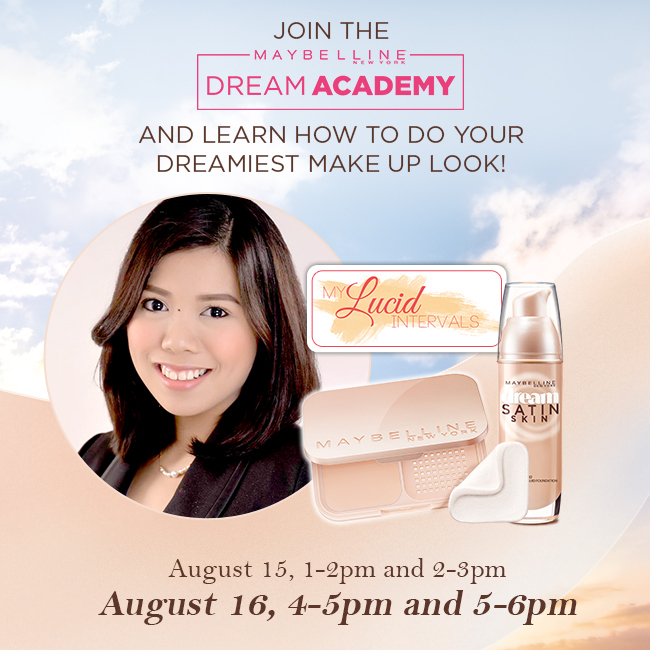 hehe Finally, I am beyond thrilled to announce that I will be having my first ever meet and greet in collaboration with Maybelline Dream Academy on August 16, 2015 at SM Makati at 4-5 and 5-6pm. (Kilig!!!!!) I am super excited and thankful that I am given this opportunity to finally meet my readers. (Actually, kinakabahan ako.. pero kiber mas excited ako na mameet kayo!). I hope you will join me to an afternoon of fun and lots of chika with Maybelline. We will be joined by Maybelline's Chief Makeup Artist, Chuchie Ledesma, for a free makeup workshop wherein she will be sharing tips and tricks on how to achieve a dreamy skin. https://www.facebook.com/maybellinephilippines?fref=ts or through this link: http://bit.ly/MNYDreamAcademy to get yourself a slot. The first 30 who will sign up/attendees will get a special surprise (CLUE:its a gift pack from Maybelline). Make sure you will register on August 16, 2015, 4-5pm slot. Comment below if you are joining the event. See you there! i really wish i could attend and see you in person! im gonna try to make this possible! Woohoo! Hope i can come! Much as I wanted to, may pasok ako on Saturday. (T_T) Hopefully, on your next event. I'll be there na para ma-meet din kita Miss Donna. Good luck on the event and congratulations to the ladies that would attend! i would like to join! i join the first maybelline academy but unfortunately i didn't make it but this time i'm gonna make it. Congrats! Gustong gusto kong pumunta pero may baby ako maliit pa kaya walang chance,Sayang gusto ko pa naman matuto ng mga basic make up especially sa eyebrows.